Political Campaigns Go Social, But Email Is Still King : It's All Politics Campaigns are Periscoping, Tweeting, Facebooking, Snapchatting and Instagramming. But campaigns and strategists say the biggest bang comes from new ways of using the ol' email list. A campaign worker live-streams Sen. Bernie Sanders speaking in Nashua, N.H. in June 2015. Presidential campaigns cost a lot of money these days — perhaps as much as $5 billion could be spent in the next election, by one estimate. Much of that will be spent on television advertising in battleground states, as expected. But spending on digital campaigning — that is, everything on a computer, smartphone or tablet — could tally as much as $1 billion by the time election day rolls around. With all that money, the campaigns are making big changes in their digital strategies — including how they coordinate with footsoldiers and better ways to find people who could become supporters. And it means big money for companies behind the scenes, who are pioneering and profiting from this new form of electioneering. "It's basically going from yelling at people, to listening to people," Will Conway, lead organizer of U.S. politics at NationBuilder, said of today's digital presidential campaigns. His company is one of many that offers a digital platform to help political campaigns connect the dots between all the data they gather. Campaigns have traditionally used one type of data, called static data, Conway said. This is stuff like voter data and consumer data that reveal things like how old their supporters are and what kind of cars they drive. But the widespread use of social media like Facebook and Twitter provides a new type of data, called engagement data, which is giving campaigns and businesses more information than before. "If this person subscribes to Field & Stream and he drives a Ford F-150, there's a high percentage chance that he's a veteran. Well, if in his Twitter bio he says he's a veteran, you know he's a veteran," Conway said. A lot of this comes down to technology enabling improved communication between all the levels of a campaign. When volunteers are knocking on doors, the national, state-level and local branches of the campaign are now able to automatically share data. For example, if you send a message about a campaign on Twitter, you could even expect a phone call from a local representative within minutes, he said. "The way a campaign has a conversation is infinitely different than the way it was, even in the 2014 cycle," Conway said. Both Facebook and Twitter want to be the platform of choice for political candidates; each company has staff devoted to working with political campaigns. Twitter is aggressively marketing itself to campaigns, journalists and organizations involved in politics — including at an event in Washington earlier this month. The event was held to promote how political campaigns can target specific Twitter users for advertisements. "If you're looking to reach influencers, Twitter is the best platform to spend money on. It is the platform of journalists, it's the platform of the party elite, it's the platform of staff, it's the platform of politicians," Vincent Harris, chief digital strategist for Rand Paul's presidential bid, said at the event. If you've seen a "promoted tweet" for a presidential candidate, it could be there for a number of reasons. Perhaps you are in a specific interest category, one of 350 that Twitter designates. Or maybe you "look like" a specific user, meaning you share characteristics and interests. Twitter representatives say they can let campaigns advertise to people in a particular area, and for the first time campaigns can now target people down to the ZIP code. For its part, Facebook emphasizes the sheer number of its users, in addition targeting methods similar to Twitter. "Facebook offers scale and reach that nobody else can offer," said Facebook Policy Communications Manager Andy Stone. Facebook has 190 million monthly users in the United States. Twitter recently reported 66 million monthly active users. Even relative social media newcomer Snapchat wants to get in on the action. The video-sharing service hosted a dinner Monday for digital strategists in Washington, according to Politico. While the campaigns are using newer social media to drive home their message, old-fashioned email addresses are still crucial to fundraising. "Nothing comes close," to an email list, said Michael Beach, co-founder of Targeted Victory, a digital campaign firm that works with Republicans. Beach worked with Mitt Romney's campaign in 2012 and now works with Rick Perry's campaign. "Our campaigns will do 70 percent plus of their fundraising through email," he said. On the Democratic side, the Obama camp took 90 percent of their online money from emails in 2012. But the way campaigns are using the lists has evolved. This time around, for example, email blasts from the Clinton campaign don't go to everyone on the list the same way. In fact, the campaign tailors their messages based on what they think will get people to keep reading them. In the month of June, Clinton's team sent out emails with 290 different subject lines. There are 5 million people on the list, but the average email only goes to 780,000 people, with many emails only going to tens of thousands of people, according to eDataSource. Based on the data obtained when people hand over their email addresses, companies like Fluent, an ad company that works with political campaigns, know things like a person's interests, likelihood of voting or donating, and even what device someone uses to read emails. Campaigns and companies use this information to tailor emails and ads. "There was a lot of investment in email marketing in 2012; there's going to be even more in 2016," said Fluent's Chief Marketing Officer Jordan Cohen. But when it comes to spending all that money they raise on the internet, television still reigns. In 2012, the Obama and Romney campaigns (not including superPACs) spent at least $480 million flooding televisions across the country. But the two campaigns spent just $78 million advertising online. Campaigns have historically spent between 60 and 80 percent of their budget in television advertising, said Beach of Targeted Victory. Candidates need to focus more of their efforts on digital, Beach said, especially to get a message to younger voters who are spending more time on their smartphones and tablets. "Their attention span has just completely been fragmented," he said. "They're all over the place. They're watching live TV, recorded TV, in apps on their phone, on social media sites." 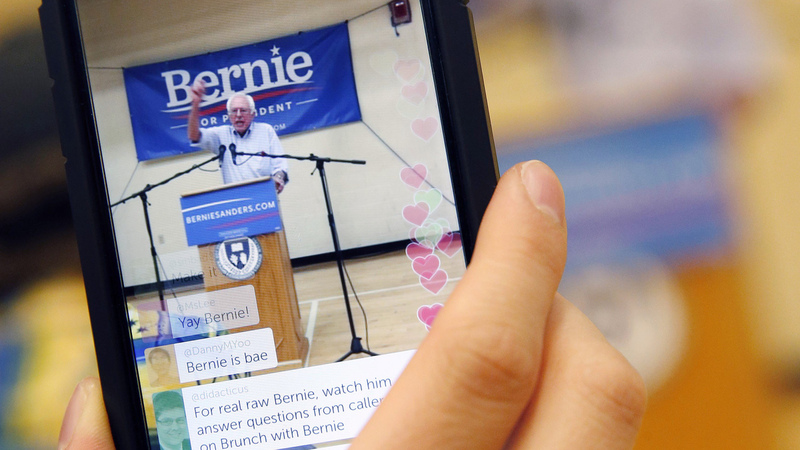 So campaigns are emailing, Tweeting, Facebooking, Snapchatting, Instagramming and more. But measuring the impact of all that social media is hard. One study found more people turned out to vote after seeing a message on Facebook. But as the The Washington Post noted, young people in particular didn't vote in greater numbers in the 2014 midterms, despite being active on social media. NationBuilder's Will Conway thinks this technological communication is beneficial for democracy. "Anybody now has the ability to be a leader. Anybody has the ability to say, 'I'm passionate about this issue, and I'm going to go find the other people who are passionate about this issue and build a movement.'" Building a digital movement this election may or may not happen, but with billions of dollars to be spent, lots of companies will certainly be cashing in.